The word "ponding" comes to mind. It was used by national water agency PUB to describe massive floods which hit Singapore in December 2011. 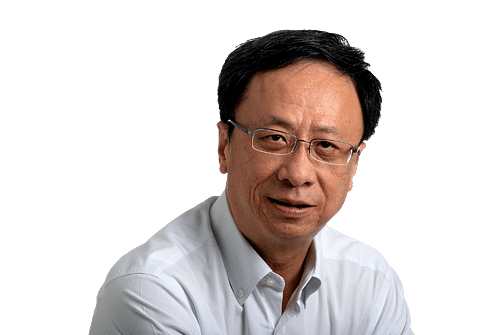 Dr Vivian Balakrishnan, then Minister for the Environment and Water Resources, took issue with that in Parliament the following month. "PUB should not have used the word 'ponding'. As far as I am concerned, I call a spade a spade. A flood is a flood," he said, echoing public sentiment. The Land Transport Authority (LTA) and rail operator SMRT described yesterday's collision between two trains in Joo Koon station as an incident where one train had "come into contact" with another train, which conjures the imagery of a nudge. SMRT repeated the same phrase on its Facebook page. "This morning at 8.18am, a train heading in the direction of Tuas Link station stalled at Joo Koon station. At 8.19am, a second train stopped behind the first faulty train. At 8.20am, the second train moved forward unexpectedly, and came into contact with the first train." It was only at 7.42pm that an updated statement by the LTA described the incident as a "collision". Their earlier reluctance to call a spade a spade severely underplays the seriousness of an accident which left 29 people with injuries. First and foremost, trains are not supposed to collide, or even come into contact with each other (unless one train was used to push out another disabled one, as has often been the case lately). That is what the signalling system is for. It keeps a safe distance between trains, acting like an invisible, impenetrable barrier between locomotives. No metro system can operate without a reliable signalling system, which is actually the eyes of the network. This is why when trains sense there is something amiss with the signalling system, or there is some interference, they will activate their emergency brakes. It is safety protocol - to be safe first rather than sorry later. Usually, a train cannot pull into a station when the one in front of it has not left the station. This is why trains sometimes stop in the middle of a tunnel, and passengers are left wondering why. More often than not, it is precisely because the train in front has stopped for too long. So, instead of breaching the invisible barrier, the second train has to stop too, even if it is in the middle of nowhere. That a train has somehow managed to breach this safety barrier is worrying, to say the least. At Joo Koon, trains switch over from the old fixed block signalling system to the new moving block system. Investigations have uncovered that the glitch which caused the collision yesterday lies with the new system. The new signalling system has been having numerous technical issues here, but none compromising safety until yesterday. So, it is regrettable indeed that SMRT and the LTA have chosen such a light term earlier in the day to describe the incident. Like the tunnel flooding which took place just last month, it is not trivial. A signalling failure can have grave consequences. You do not need to have a vivid imagination to think of what might have happened if either train had more passengers. And if a "coming into contact" nudge can result in 29 people getting hurt, think of what a high-speed collision would entail. In the 30-year history of Singapore's MRT system, there has been only one other train collision which resulted in injury. In 1993, one train ran into another at Clementi station, resulting in more than 150 people getting hurt. The incident triggered a public inquiry, which found that an oil spill on the tracks had compromised the stopping ability of the second train. It was not a signalling issue. 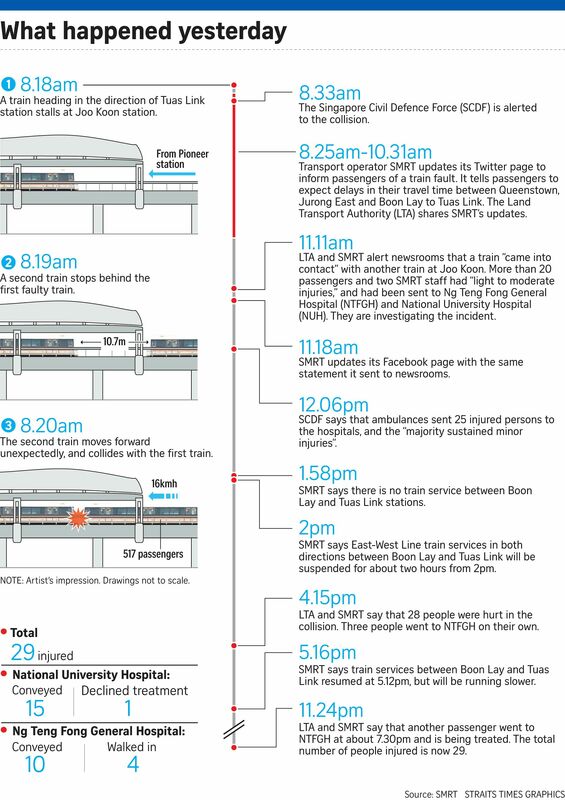 SMRT and LTA have to come out with full transparency on how yesterday's incident happened, and what concrete steps are to be taken to prevent a recurrence. They will no doubt do so, just as they did after the Oct 7 tunnel flooding. Reams of information will be made public. And herein lies the rub: How does seeking to minimise yesterday's incident help reassure a public whose confidence has been shaken repeatedly since 2011 that the issues are being put right? A sagging power-supply rail brought the North-South Line to a standstill on the evening of Dec 15 that year, and then again on the morning of Dec 17, as SMRT failed to detect and rectify the damage completely. Affecting more than 250,000 commuters, it was the biggest disruption then. Another public inquiry was convened, and SMRT reshuffled its top management. A power-supply trip caused both the North-South and East-West lines to fail on July 7, 2015, affecting about half a million commuters, the highest number on record here as of now. The LTA said a salt-caked insulator near Tanjong Pagar station was the cause. A power trip at one of the network's substations caused the western sector of the North-South and East-West lines, parts of the Circle Line, as well as the Bukit Panjang LRT system to fail on April 25 last year. The unprecedented four-line disruption was suspected to have been caused by cable works on the East-West Line's Tuas West extension. On March 22 last year, two SMRT trainee technicians were killed on the tracks near Pasir Ris station. Investigators found that a slew of standard operating procedures had been breached. The Manpower Ministry said SMRT had been flouting such guidelines since 2002. On Oct 7 this year, tunnels between Braddell and Bishan stations were flooded, with water reaching waist level at some points. While preliminary investigations found that the crew in charge of maintaining the flood-prevention system at Bishan had not been doing their job properly and had in fact falsified work logs, the various individual key components such as pumps and switches were found to be in proper working order. Even as Singaporeans were coming to terms with the flooding, yesterday's train collision took place.